One of the now seemingly permanent features of the national and international cycling calendar is the Tour of Britain. It is an event that can trace its roots back to a race that was planned to start from Catford – the first ever British stage race. Cycling stage racing has been common on the continent with races such as Le Tour de France and Giro D’Italia having their origins in the early 20th century. In Britain road racing had been effectively banned since the end of the 19th century. 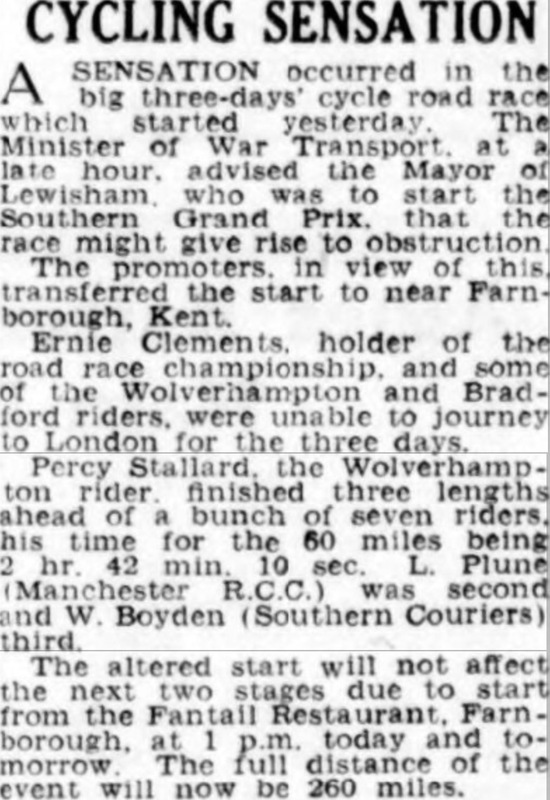 Time trials (where riders start on their own and race against the clock) were eventually tacitly allowed often in remote locations with ‘code-named’ courses to avoid any police interest.’ (1) Mass start races were only ever allowed on tracks, such as the short-lived one on Catford’s Sportsbank Street or Herne Hill, or later on airfields or motor racing circuits – some of the earliest racing at Brands Hatch was cycling, as well as more notably at the Brooklands Circuit (2). 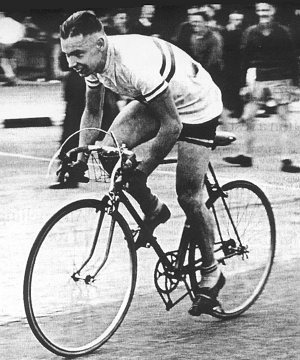 The first road race with a mass start had been organised in 1942 by Percy Stallard, (picture source) it was a single stage race from Llangollen to Wolverhampton. He and the other organisers and riders were all banned by the National Cyclists’ Union (NCU) as a result. Stallard set up the rival British League of Racing Cyclists (BLRC) to promote racing rather than time trialing. With Midlands roots, it was perhaps surprising that a war-torn London was to be the location for the (not so) Grand Départ of the first English Cycling stage race. Perhaps using it as a fundraiser for the Red Cross helped and perhaps it was seen as a morale booster for those suffering at home. Presumably when the organisers had agree the route with the authorities, London seemed a relatively safe location – there had been a lull in attacks following the end of the Blitz. But from June 1944 London was again targeted by the Germans. The first V1 rockets hit Lewisham on 16 June, including attacks on Lewisham Park and the areas around George Lane and Davenport Road. Around a 100 more were to hit Lewisham in the 7 weeks before the planned start, so it was probably understandable that the Ministry of War Transport wanted the start moved (5). 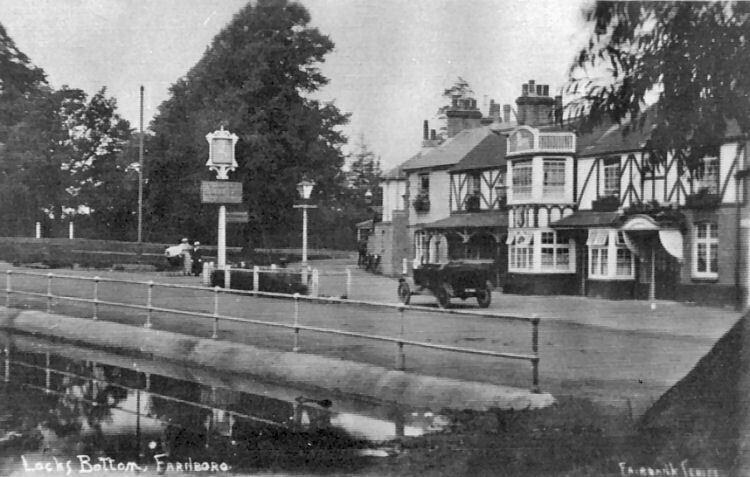 The race was moved to Farnborough, where, in the end, all three stages started outside the Fantail Restuarant, almost opposite the Ye Olde Whyte Lyon pub, pictured from around three decades before (6). As for the race, the first stage was won by the organiser of the initial Llangollen-Wolverhampton race, Percy Stallard. The second stage saw Les Plume from Manchester triumph, despite the seemingly safe location in the Kent countryside, during the race the RAF shot down another London bound doodlebug very close to the peloton. With shrapnel coming down around the cyclists, the eventual winner wondered whether they should be in an air raid shelter rather than racing. The final stage saw a lone breakaway, won by Ron Baker with a sprint for the rest of the podium places of the stage won by Stallard, over ten minutes behind the winner. Les Plume took the overall victory by just a second from Len Hook who had placed well on each of the stages. Baker took the King of the Hills competition. The following year there was the Victory Cycling Marathon from Brighton to Glasgow and a similar national stage race has been almost ever present (there was a five year hiatus from 2000). 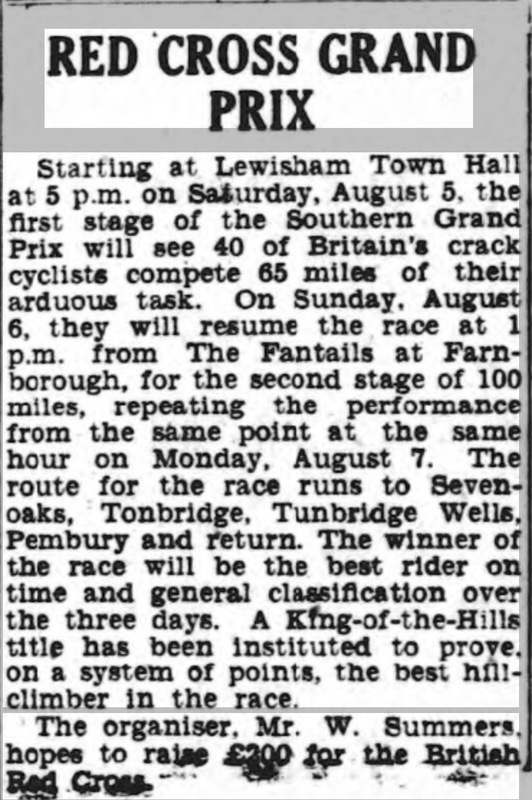 This entry was posted in Lewisham History, Sporting & Aviation Pioneers and tagged Catford, Cycling, Lewisham Town Hall, Red Cross Southern Grand Prix, Southern Grand Prix, Tour of Britian on September 2, 2017 by Paul B. Hidden away under trees in the corner of Manor House Gardens, close to the library, is a large block of masonry carved in a way reminiscent of Victorian graves – it is clearly a foundation stone, one of a trio of similar stones in the same area. Unless James Brooker was very busy on 27 July 1874, it is the foundation stone of the old Lewisham Town Hall. It was initially created as the Vestry Hall for Lewisham and Penge, becoming the Town Hall after local government re-organisation in 1899. The building was ceremonially opened a year and a day later on 28 July 1875 at a cost of about £11,000 which was shared 2/3rd to be paid by Lewisham and 1/3rd by Penge based upon their respective rateable values. 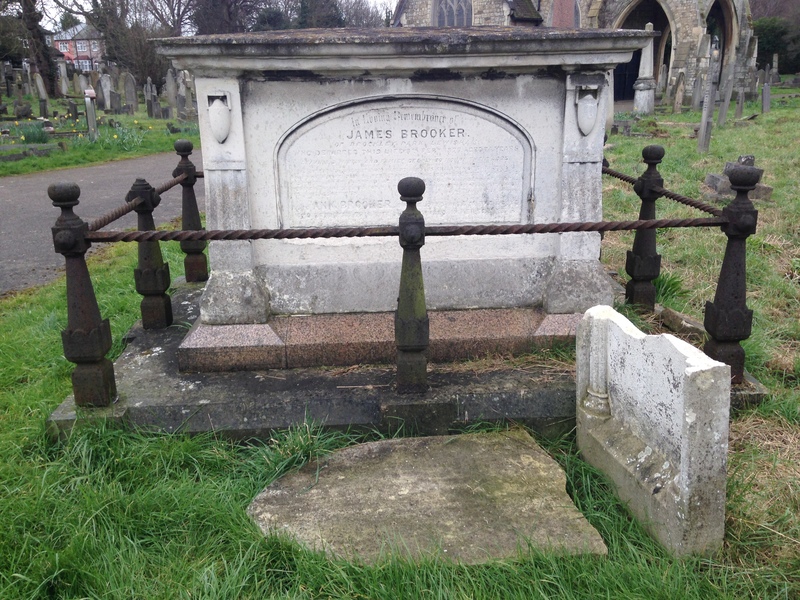 So who was the James Brooker? He had been born in 1803 in Newington or Walworth (depending on the census) then in Surrey. He married Ann and they had stayed around Newington; all their 9 children seem to have been born around there and in 1841 he was living in Gloucester Place. By 1851 he had moved to Forest Hill, and listed as a ‘master builder’. He was elected to the Lewisham Board of Works from its formation in 1856, chairing it from 1857 and also representing the District on the Metropolitan Board of Works. He carried out a variety of other civic roles including Poor Law Guardian. In the 1861 census he was listed as living in Brockley Park and a decade on he was living in St German’s Road. The foundation stone from 1874 and a few other on line references to him on-line have him back at Brockley Park. The natural independence of character and integrity of character possessed by Mr. Brooker, coupled with his urbanity and impartiality as chairman, endeared him the respect and esteem of all with whom he was associated, whilst his public spirit and devotion rendered his life and services very valuable to the public generally of this district. He was buried on the Lewisham side of Brockley and Ladywell Cemetery where the work of, perhaps, the same monumental mason as the foundation stone recalls his life in now fading detail. The Town Hall was in rather grand Gothic Revival style and its architect was George Elkington, who was born in Bermondsey in 1824. He was described as ‘Architect to the Lewisham Board of Works’ at the time of the design. He seems to have moved on to a similar role in his home borough, designing a similar grand vestry hall for the Bermondsey Board in 1879. 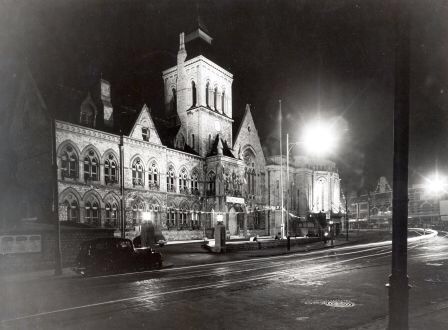 It too is no more, it was demolished in 1963 following WW2 bombing. There is some video footage of this at around 45 seconds in on the YouTube video below, which was one of a trio made on the work of the council in the early 1930s. Running Past has touched on some of this in a post of Solarium Court and the Salters (the other two videos are embedded there). The only known building of his that survives is the Leather Hide and Wool Exchange, also in Bermondsey which remained active until 1912. His other legacy is Southwark Park – he produced the initial plans for it, although in the end more modest proposals were adopted. He later seems to have had his own south London practice, with his son, also George who continued it after his father’s death in 1897.. The builders were Higgs, Hill and Hill was who were based in Vauxhall – they had been formed by a merger the year the foundation stone was laid, so it would have been one of their first major projects. The initial ‘Higgs’ was dropped a few years later when one of the founders retired. They continued in business until 1996 when they were taken over by a Dutch construction firm. There is video footage of the Town Hall from the 1920s when Hither Green channel swimmer, Hilda ‘Laddie’ Sharp when she was greeted by the deputy Mayor following her successful swim, covered here in Running Past. The video has not been uploaded onto YouTube so cannot be embedded in WordPress but can be watched here. 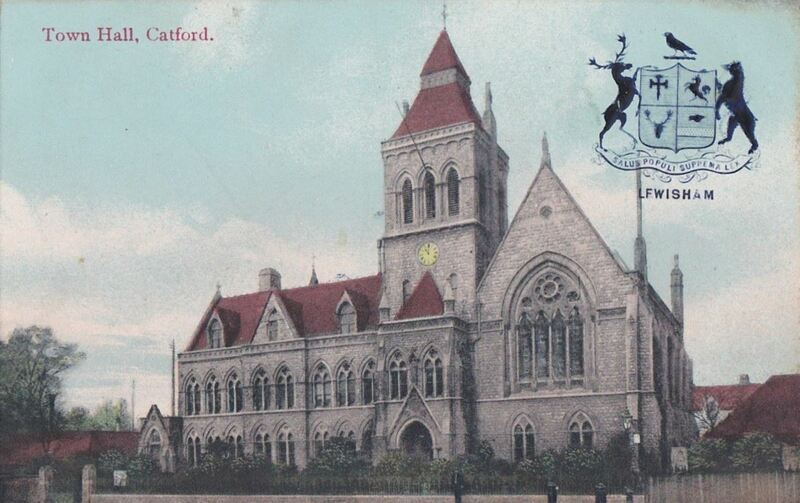 Just as local government re-organisation had seen the extension of the Town Hall at the end of the 19th century, the old Town Hall and the neighbouring St Laurence Church, were demolished in 1968 to provide a more modern Town Hall for the new, expanded London Borough of Lewisham. 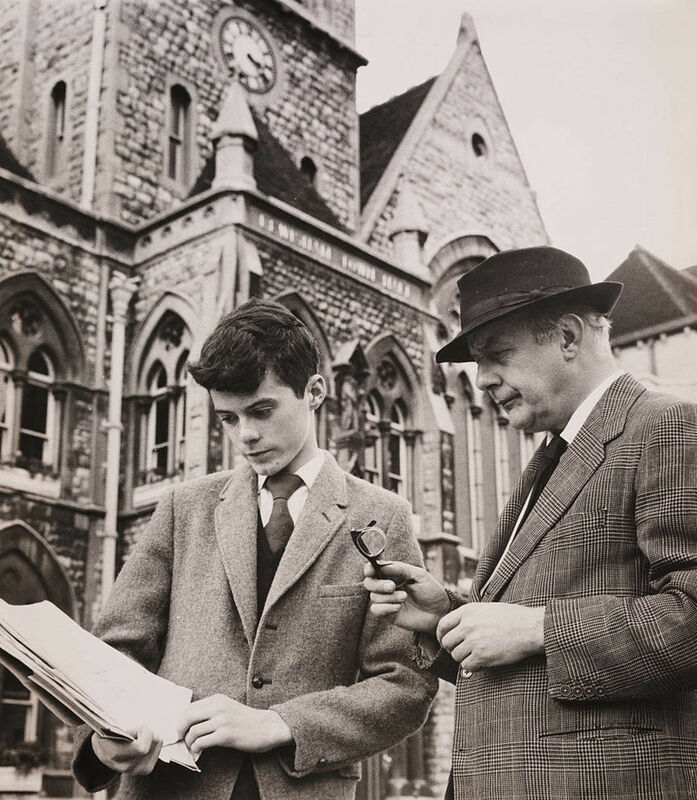 This was despite the involvement of Sir John Betjeman in a campaign against their demise – a picture from which is shown below. Of the two other stones, one is rather weathered and the lettering unclear to the naked eye. The other marks an event in 1857, presumably another unveiling, by Marian Legge, wife of the Reverend Henry Legge. It doesn’t seem to relate to the Manor House, despite its prominent location at the rear, its date wouldn’t obviously link it to any of the ‘lost’ churches of the immediate area or even St Laurence Catford – all were a little earlier or later. So if anyone can through any light on this it would be much appreciated. Legge was Vicar of Lewisham between 1831 and 1879, he was no humble rural parson – the fifteenth child of George Legge, 3rd Earl of Dartmouth, one of the major Lewisham landowners of the era. George Legge was patrons of the ‘living’ so it was a ‘job for the boys’, well one of his anyway. 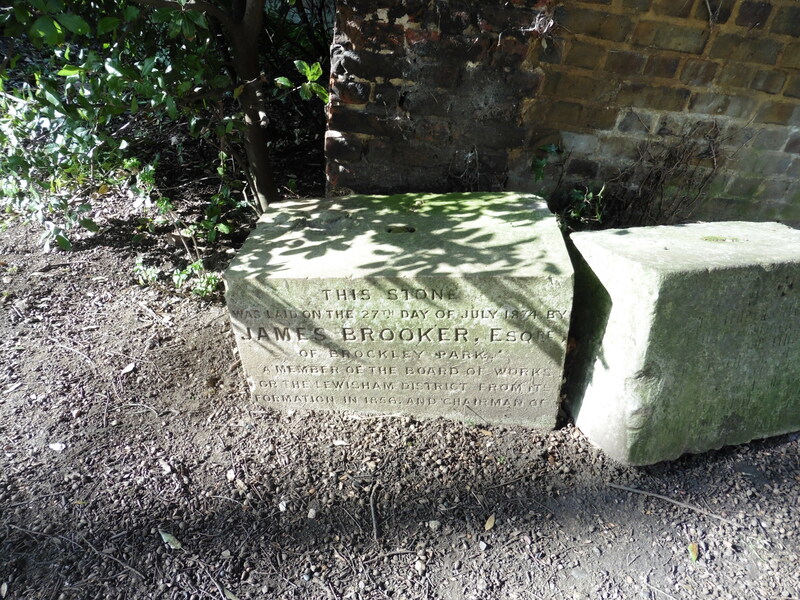 This entry was posted in Lewisham History and tagged Brockley and Ladywell Cemetery, George Elkington, James Brooker, Lee Manor House, Lewisham Town Hall, Manor House Gardens, Manor House Library on April 27, 2016 by Paul B.